An independent production company working on short films, commercials and features. I had a fantastic experience going down to Polegate yesterday on my "Ohna and Perry go large" adventure. Making short films is such a funny thing. It's all-consuming because you have to eke out from within you everything you possibly can to get them made - and of course get it made WELL otherwise there is no point doing it at all. A real labour of love and passion. But you find yourself doing crazy things. Like asking total strangers for money and asking for favours from people you barely know - expecting people to go well out of their way to help you buy a car for instance! I booked two return train tickets to Polegate (right next to Lewes) and prepared a picnic - for me and my neighbour's dad Perry, who good naturedly said he'd help me! A charming Northern Irish man from Belfast who has been in the motor trade pretty much his entire life - and therefore - a car expert! He mostly dealt with Porsche cars (he's retired now) but seemed to know pretty much all and anything you need to know about most brands of cars. Having met him at my neighbour's Christmas parties over the years, he was the one person I could think of who might help me in my quest to find and buy an old car that would serve us well for the short film and ideally next year for the feature film too (in any case ideally not turn out to be a money pit). And so we went, with a little ad I found on Gumtree and some advice given to me by Dimitri, the action vehicles man. Having primed the seller we were coming, and arranging for him to meet us at the station to take us back to his to test drive and check the car, I of course knew that my negotiation powers were much reduced because the seller knew I had taken out a big chunk of my Saturday to go see the car, and that I needed it NOW. So we poked, and we drove the car, and we pointed out all the flaws (including a flat battery and leaking oil) - which isn't too difficult in a car which is 27 years old - but after a lot of discussion, shrugging, gesturing and being driven back to the station for fault of coming to an agreement' - we did eventually buy the car!!! 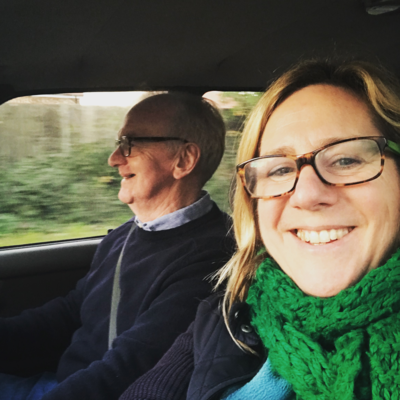 I was so grateful to have Perry by my side for the negotiations and the journey back - he had to do all the driving as I have no driving insurance of my own (having crashed my last car on the French motorway, and leaving it in all its bits and pieces behind me never to be replaced). Until now! I got the car taxed and Perry had to drive it the 70 or so miles back to London - we even got banged into along the way (tailgate accident) and what matters most I guess is the car drove us flawlessly, smoothly, purringly back to London and is now parked outside my house ready to go on Friday. 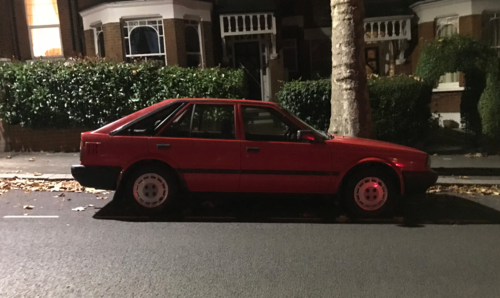 And I fell in love with her - a little old-fashioned Red Nissan Bluebird!! According to the expert, Nissans are actually very reliable cars that rarely go wrong. Now I have to just cross my fingers and hope he is right... 5 days to go. Such a huge ask of someone I only really know from occasional parties, got plenty going on without my demands, including two lively grandchildren, and him having to drive for more than 3/4 hours back in the darkness of the open countryside, the motorways and then crazy congested London... With crazy people all dressed up for Halloween popping up everywhere. I loved hearing all his stories. Thank God he's a lovely man, a generous spirit and a tireless raconteur - a bit like another dad I know!! Doing these crazy things can bring you closer to people too. So we launched a Kickstarter campaign yesterday for Mercury and hopefully we will raise £7,500 by November 16 2017 11:10am (not sure if that's GMT or USA time). I know it's a lot of work getting people to back projects like these when there are so many similar crowd funding campaigns on the go and so many raising money for helpless desperate causes as well as these artistic endeavours. In any case we will keep the Mercury instagram feed alive with fun content, keep pushing and hope for the best! I'm really enjoying that it's making me get in touch with everyone meaningfully - as it's a big deal asking people for money. So far by the end of Day 1 we had reached just under 19% of our target so I think that's really good. On a prep front we have finished workshopping with our actresses now. We've started working out costume and props, we're locking down locations and searching for additional cast and street locations. We fell in love with St Thomas Hospital as our end location, and for where Al and Bambi start off, the Broadwater Farm Estate in Tottenham (where the film is set) is amazing - so we hope to get permission there sorted and work out our street locations over the next few days. 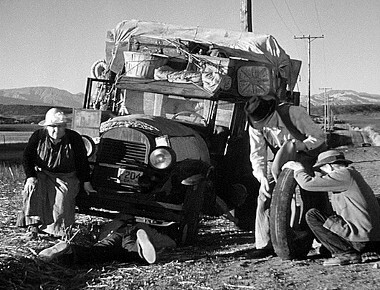 Our challenge this week is to find the third hero of our film: THE DREAM CAR! 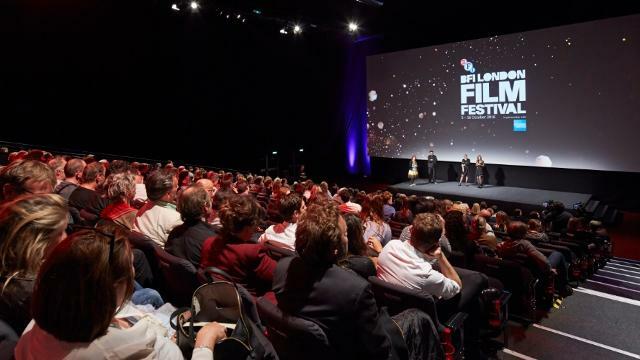 The BFI LFF came and went once again with me being too busy to go to much - what a shame! I missed so many of the films I was hoping to see and the events I was hoping to go to. I did manage to see three films - which is better than 0 films! I saw two fellow Torino Film Lab participants' projects. A first feature for Michael Pearce - Beast was the first press screening I saw, and the second was Sicilian Ghost Story a second feature for Fabio Grassadonia and Antonio Piazza - which I had missed in Cannes Semaine de la Critique. Both really good films I enjoyed. Beast was intriguing, building up intrigue in a Broadchurch style - death and brooding. Small neighbourhood, families and tensions. Interesting character studies - the bullying leading to bullies or tortured souls and revenge or bottled venom always near the surface. Sicilian Ghost Story had a bit of a feel of Bridge to Terabithia to it. Strangely poetic considering it's in fact the grizzly story of a little boy kidnapped by the Mafia for 779 days before being strangled and body put in acid & thrown out to sea. The children ivolved are the main focus - and they are whistfullly bonnie and magical considering their surroundings. And the third film was Lean on Pete - Andrew Haig's film shot in the USA. A story about a boy growing up in a dysfunctional trailer-trash single-dad family. Dad ends up getting himself killed so the boy finds himself on his own. 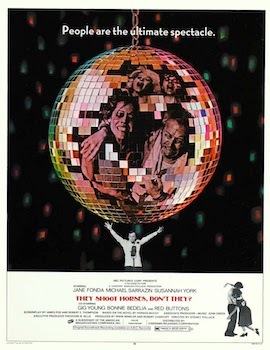 The film is the boy's story (Charlie) who has to learn to look after himself. He's super sweet, so people take to him pretty easy, so even though he is in a harsh and desolate part of the States - everywhere he goes seems a bit modern-day Grapes of Wrath. What starts out as a story about a boy and a horse - how it might transform the boy in a coming of age-new-goal-for-moving-forwards-in-life kinda way, turns into more of a quest for a new substitute mom (at least someone to feed him and keep him sheltered): salvation comes in the form of his estranged (and hard to get to) aunt who he longs for. There were many lovely things about the film, and the actor playing Charlie was very sympathetic (Charlie Plummer), has a great face and is very watchable, I'm sure he'll do really well. There was a bit of a Dust-bowl They Shoot Horses Don't They vibe to the film. I think it was actually a quiet and internal portrait of Charlie with hard times, a horse, Steve Buscemi and Chloe Sevigny part of the backdrop. 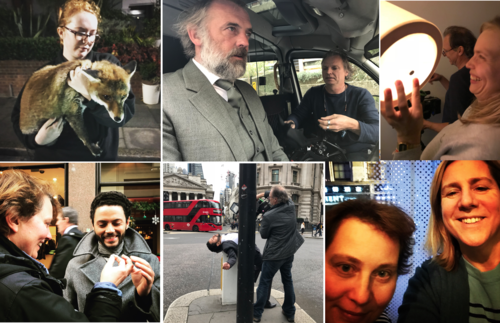 And the reason I missed out on the London Film Festival this year, was because Clara Van Gool managed to get the additional funding she needed for her feature film The Beast in the Jungle from Luxembourg and we were busy with taxi cabs and foxes shooting a few days in London to make Luxembourg look like the UK! Amazing to think we shot the pilot for that 4 years ago now - back in 2013, looking back on old posts. 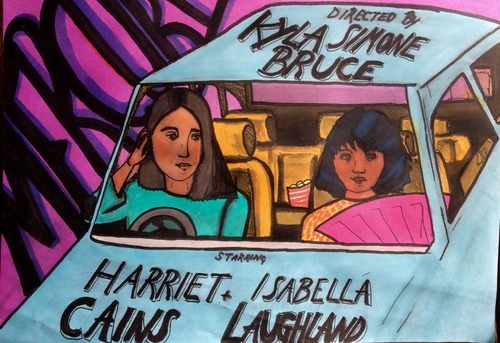 Such a beautiful film and so clever of Clara to think to work with talented dancers Dane J Hurst and Sarah Reynolds (both from Voices of Finance which we shot here this time 2 years ago) as the two mains John Marcher and May Bartram and Sam Louwyck as the Taxi Driver. As ever with Clara and KeyFilm, we had to shoot a little à la guerrilla style - and we had a couple funny little hitches with the police! At one point where we were shooting outside the Ministry of Justice, a van pulled up and two high security police were deployed because we'd abandoned our very suspicious-looking 60s briefcase against the wall. I was amazed how quickly they came. All was well - though - and nothing got exploded, and no one got arrested!! Lizzie Francke at The BFI and Simon Field at Illuminations Films have been great supporters of the project in development. The film is produced by KeyFilm in NL and co-produced by Amour Fou in Luxembourg.